It’s been a while since I reached out which hasn’t been due to lack of words to share. December was a blur getting the New Year issue to print while juggling family, friends and festivities… always a little challenging, but isn’t it so for all? With January came a breast cancer diagnosis. Now don’t worry, its a common type (invasive ductal carcinoma), small, and stage 1. But I am quickly learning that the BIG C presents with it a new and overwhelming project to manage along with everything else in your life. Those who have received any complicated diagnosis certainly know what I’m talking about. 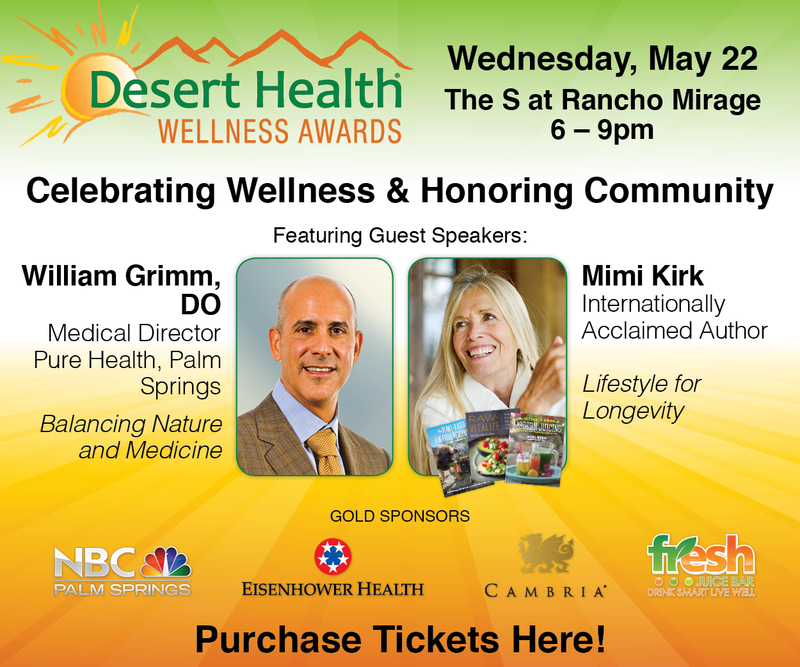 I am very fortunate and grateful to have my Desert Health family. The practitioners showing support is heart-warming and invaluable. I am definitely in good hands. The first place I turned was my naturopathic doctor to change the things I could easily control – my lifestyle. With her encouragement, I gave up coffee, alcohol, ALL sugar (now reading labels), and my bio-identical hormone therapy – COLD TURKEY. Twenty days in and I can’t believe I haven’t killed anyone or jumped off a cliff. It’s actually been easy (a cancer diagnosis is certainly motivating). I continue with my daily meditation and yoga practice, and have slowed the pace quite a bit. The best advise I have gotten so far was from my psychic friend Timothy Courtney who felt that this part of my journey may be more spiritual than physical. He asked me to write down signs from the universe to help pinpoint unresolved issues I wasn’t honestly facing. Within two days, those signs opened my eyes to what he was seeing. With clarity and new found courage, I made significant changes to be true to myself, and it has enhanced my life tremendously. The realization was astonishing and has helped create a positive, healing environment (inside and out) for me to face this diagnosis with all the strength and serenity I need. I feel more at ease than I have in a long time. Life is a journey with so many lessons along with way. For this overachiever, the curve in my path has presented an opportunity to slow down, look inside, and to love, care and put myself first. Sharing with you helps me, and I certainly hope it can help you in some small way as well. THE BALANCE: Don’t wait for a life-threatening diagnosis to face unresolved issues. Clearing them can free your spirit and helps create the very best – and truest – version of yourself. Thank you for your inspiring words. Thank you for your strength. Thank you, my friend. I love you, Sista! There’s only one journey. The destination is into the fullness of each moment. Your blog post is a great reminder that this is where wholeness can be found. Thank you again Lauren. Your leadership reverberates outward endlessly. What you have shared with us is inspirational, motivational, and truly life-changing for the greater good. Our lives are absolutely amazing when we choose to love ourselves and then act as so. …lots of love to you!